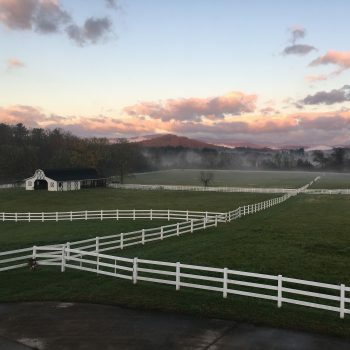 Spanning 85 acres of pristine pastureland bordering the historic French Broad River, The Horse Shoe Farm is the ultimate Asheville horse retreat. The property offers four seasons of equestrian accommodations that cater to both horses and their owners. Located in nearby Hendersonville, North Carolina, The Horse Shoe Farm is an Asheville horse retreat that offers a sense of seclusion. The beautiful Blue Ridge Mountains backdrop the property, allowing guests to feel as though they’re immersed in nature. However, we’re located a mere 30 minutes away from the Tryon International Equestrian Center. The Asheville Regional Airport is also just a ten minute drive away. But for those who are seeking the ultimate in travel convenience, take advantage of our property’s private helipad for an instant arrival time. Asheville horse retreat accommodations at The Horse Shoe Farm are uniquely designed and all-inclusive. Horses can graze freely on over 50 acres of fenced pasture. They’re also privy to an outdoor riding ring, a number-of field run in’s, a horse feed room, wash stall and tack room. We also have fourteen spacious 12 x 12 horse stalls, eight of which are heated. The Horse Shoe Farm is also the only Asheville horse retreat that offers guests the chance to stay in a “barndomonium.” The Stable House is the most iconic building on the farm. Our luxury equestrian facilities are located on the first floor. Warm pine planks flank the catwalk, which lead directly out to our beautiful pastures. But on the second floor, we’ve restored the loft into a modern and spacious guest home. Ten guests can comfortably stay in the rental, which boasts five bedrooms, three bathrooms and 4,300 square feet of space. The open concept dining and living rooms make for a great gathering space for family and friends. And the elevated deck allows for sunset soaked dinners with expansive views of the farm. Book your stay today at the most unique and all-encompassing Asheville horse retreat in the area.